I absolutely love Halloween! I am going a little crazy this year for my baby’s first Halloween. This is costume number 2 for him, and he’s 6-months-old by the way. 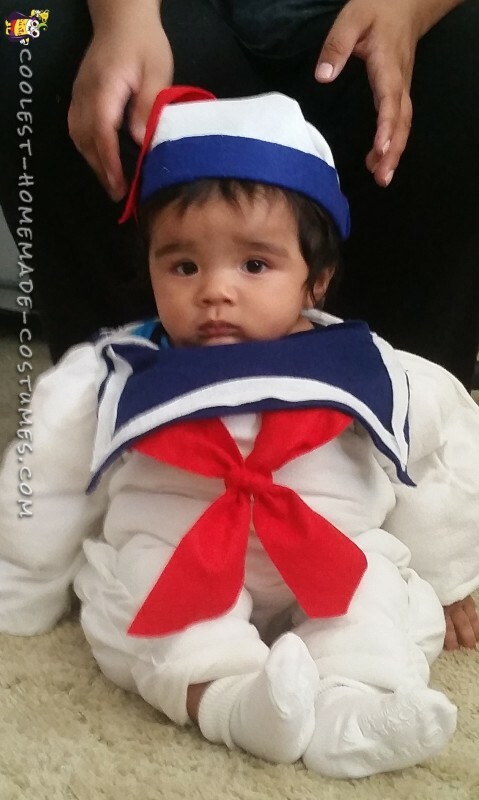 Since I found out he was a boy I automatically knew he’d be Stay Puft Marshmallow Man for Halloween. I looked to buy it but for the price they were asking they weren’t too great and the ones that were amazing are waaaaay out of budget for a crafty mama like me. Twin white flannel sheet (jersey knit would work better) OR fabric. Baby PJ’s (footed PJ’s would also work!). They fit snug but comfy and you don’t mind losing them. Blue, white & red fleece. First I use a set of PJ’s to make a pattern from the white sheet. I made two of them but widened around it about 3 or 4 inches, it depends how big you want the body to fit around baby’s body. Then I pinned and sewed it all shut, minus the neck, arms, and leg holes. Next, I sewed the actual PJ’s inside of the big PJ’s I just sewed up. I sewed around the hems, leaving the neck, arms and legs holes still open. If you don’t want the rolls on the legs or arms right now you can stuff it as you please and sew it all up. I wanted rolls so I started with the legs. I’d push stuffing between the PJ’s layer and the white sheet. I wanted about 2 inches, and then I sew around it. I’d stuff another roll and sew it again. Three on each leg and two on the arms. I stuffed his belly and tried it on him but it was too chubby for comfort. So try it on, and make sure it’s not too heavy! Then I hemmed it all up except the neckline, I would make the blue fleece his collar and use white felt for trim. You can hot glue it but I chose to sew it on. I get messy with hot glue. I sewed the fleece to the neckline in 2 pieces, front and back. I grabbed some red fleece cut two strips made an X and knotted the middle. Attached it to the bottom of the blue fleece by sewing or hot gluing. For the hat, I measured his head with cardboard and cut to size. I used blue fleece to cover the brim. Then used the brim to cut a bigger circle, push it in the middle, glue around the edges and pushed it up. I topped it off with a strip of red fleece and blue button hot glued. I’m still debating whether to write Stay Puft on the hat or not. If so I may use some fabric markers. If I did it again I would sew it all together at once instead of 2x. 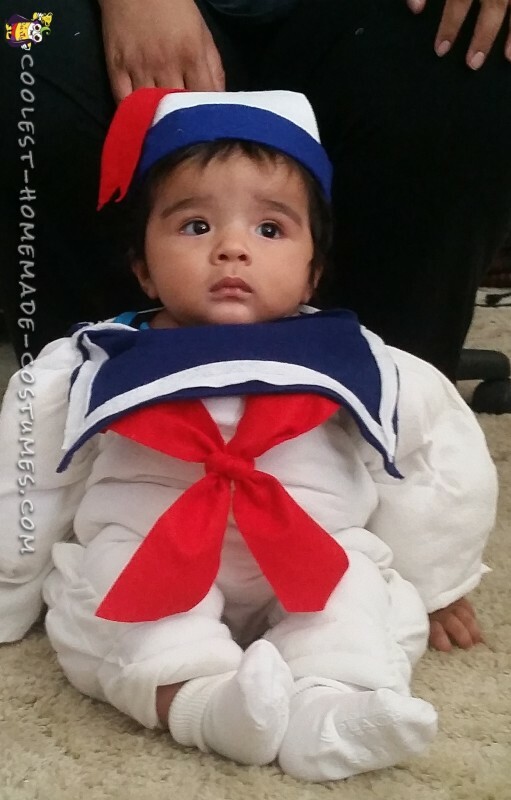 Add some white socks if you went with footless PJ’s and you have a Stay Puft Marshmallow Man baby costume!